Happy Monday! I hope everyone’s day started out wonderfully! So the snow didn’t last very long, just a few flakes here and there. But it’s extremely icy out this morning! Be careful, Seattlites! I had a great run on the treadmill yesterday! I did 4 miles between running and walking on hills. My legs were feeling great and so was my throat; until I got home and started to cough again. Bummer. I had an amazing lunch, though. 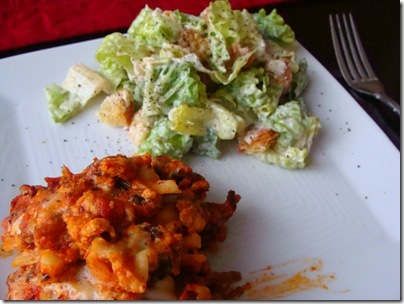 I took out some frozen lasgna that we had in the freezer and warmed it up + paired it with a wonderful caesar salad. I love caesar salads. I normally do not eat salads with dressing on them besides a little oil but caesar is one of my favorites. I ALWAYS make an exception for them! 😉 With A LOT of fresh cracked black pepper – a total must! It was a nice, lazy day yesterday. A lot of football watching and lounging. Dinner was not exciting last night – an apple with PB and some yogurt with granola/trail mix. I didn’t end up eating the yogurt, though. 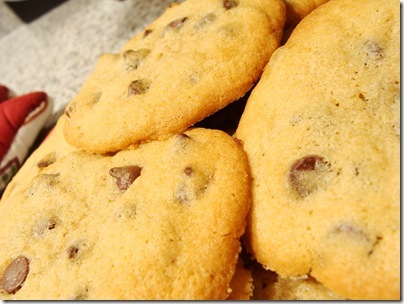 I also put on my baking apron and whipped up a batch of chocolate chip cookies for Marc. I used an entire bag of chips – chocolate heaven! 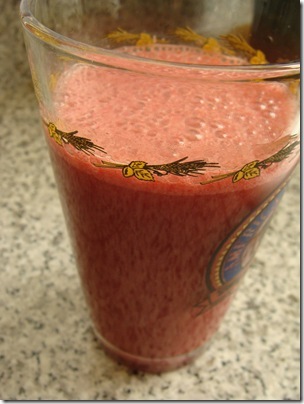 I used my good ole standby mix – an apple, a beet, one carrot, 3 clementines, 3 huge handfuls of spinach, a banana and some ice. Confession time – I need to workout more. I need to make time for working out as I have problem areas that I have been lazy about. Yes, I do run but that’s about it. And even this is few and far between. I think I use J as my crutch – making excuses that revolve around him. I hate it, I know I need to up my time and effort to start results again. I want to run a half marathon in June and I know that I am not going to be ready at the pace I have been going. Plus I need to start incorporating more resistance training – I have NOT been doing this at all. So I need some ideas: what keeps you motivated to continue to workout? What are some tools that help you? I need to start being more proactive and talking the lead! Chelsea : here is the nutrition information for the scones. 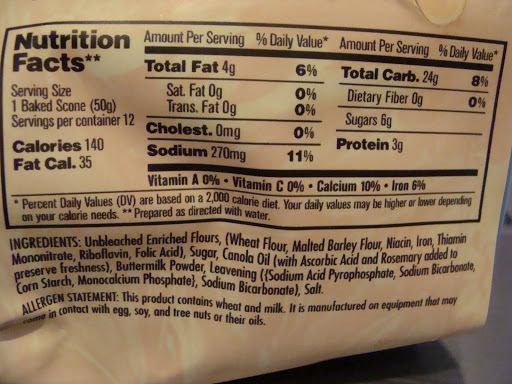 I made half of the bag – the instructions and nutrition info is for the entire bag. So I am guessing that it’s fairly accurate for one of my scones. All I do is add water, that’s it. 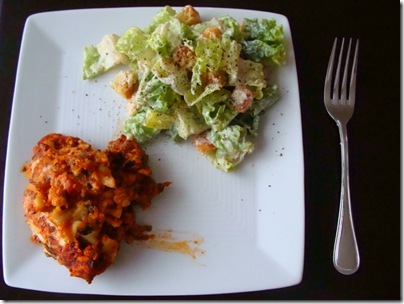 This entry was posted in baking, breakfast, chocolate, cookie, half marathon, juicing, lunch, running, weight loss, workout. Bookmark the permalink. Great workout on the treadmill. I've been doing many treadmill workouts with this coldness. I love pasta and a good salad. Oooh, your juice makes me so excited for Christmas because after that I can have juice too!! ;)I think someone already said this but do you have any dumbbells at home? I work out at home and though I have other equipment, I find that I really can do just about everything I need to go with dumbbells … even just a set of 10 lb dumbbells can really work for me. i need to find motivation to work out too. i was really good while i was trying to lose weight. now that i'm managing to maintain my weight without working out… i avoid the gym which i don't want to be doing. its a constant battle! i'm also self conscious about doing weights on machines too… mainly cause i'm so wimpy! lol. good luck! Hey! I totally understand your I-Have-A-Baby-and-Can't-workout dilemma! I feel like I use D as an excuse too. Sometimes, its legitimate, other times it's just an excuse. Do you have a treadmill at home? I love mine. Do you read N Her Shoes? Bobbi posts great at-home workouts that require little time and equipment. Other than that, take advantage of 5am and build up your video collection:) Good luck! It's a constant battle. Do you have any free weights in your home? I find even doing a couple of sets for your arms works wonders even just a few times a week! Muscle is a wonderful thing to have! If you don't know how to use the machines… ask someone girl!! Much better than a) not doing it at all, or b) getting injured!You DEFINITELY could run a half marathon in June!! I trained for the one I did this past July for 5 weeks. I was running quite often prior to that too though. You could totally do it.Hope you are having a good day! I want to find those!!! YOM!!! Did your PT not teach you how to use the machines? Could you get one session where you they teach you how to work the machine?As for the juicer-I really want one? What kind do you have and how much space does it take up? I'm looking at the Breville but the size freaks me out!